With introduction of thrust-vectoring F-22 and Su-35, many claims have appeared, such as that thrust vectoring aircraft are most maneuverable in the world and that addition of thrust vectoring alone guarantees that fighter in question will be unrivalled in maneuverability, excepting of course other thrust vectoring aircraft. These claims hold that addition of thrust vectoring by itself is enough to turn otherwise-sluggish fighter aircraft into supreme air-to-air machine. Things are more complex than that, however; effectiveness of thrust vectoring depends on aircraft’s aerodynamic configuration, speed and altitude. One of advantages of thrust vectoring is allowing aircraft to enter and recover from a controlled flat spin, yawing aircraft without worrying about rudder, which looses effectiveness at high angles of attack. However, aircraft using close coupled canards instead of thrust vectoring have also demonstrated flat spin recovery capability, example being Saab Gripen. But while thrust vectoring reduces drag during level flight, thus increasing the range, close-coupled canards add drag and decrease lift unless aircraft is turning, thus improving the range. But to see what impact thrust vectoring has on combat performance, we have to take a look at parameters I have defined above. Mass of aircraft determines inertia – thus, heavier the aircraft is, longer it takes to switch from one maneuver to another quickly. This results in slower transients, making it harder for pilot to get inside opponent’s OODA loop – in fact, mass is defined as a quantitative measure of an object’s resistance to acceleration (to clear common mistake in terminology, acceleration can be in any direction – in fact, what is commonly called “deceleration” is mathematically defined as “acceleration”). But to actually turn, aircraft relies on lift. Lift is what allows aircraft to remain in the air, and when turning, aircraft uses control surfaces to change direction in which lift is acting, resulting in aircraft turning around imaginary point. It can be approximated by wing loading. But turning leads to increase in angle between air flow around the aircraft and the aircraft itself (this angle is called Angle of Attack), which results in increased drag. Increasing drag means that aircraft looses energy faster, and once fighter’s level of energy decays below that of his opponent, he is fighting at disadvantage. 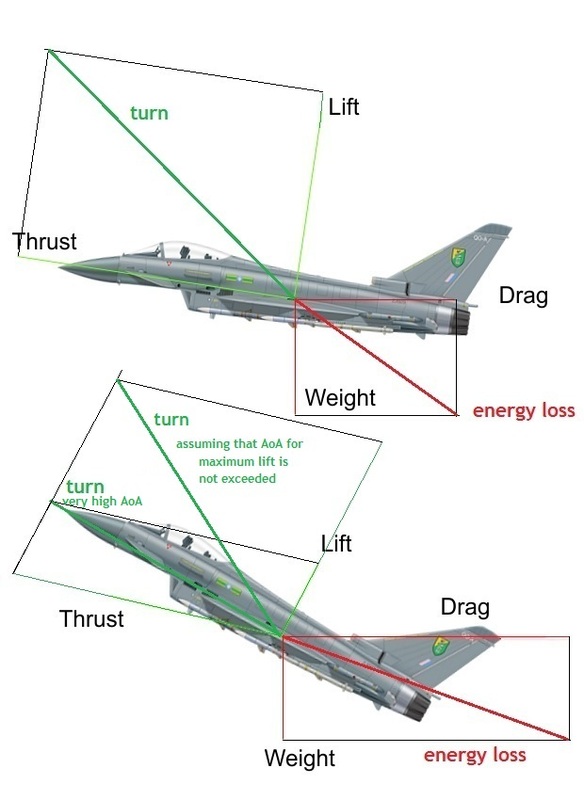 Loss in energy can be mitigated by excess thrust, which can also be used (usually in combination with gravity, aka downwards flight) to recover lost energy. All of this leads to expression “out of ideas, energy and altitude”, which basically means “I’m in trouble and have no way out”. Nose pointing allows aircraft to gain a shot at opponent with gun, and was crucial for gaining a shot at opponent with missiles before advent of High Off Bore capability, which shifted requirements more in direction of ability to sustain maneuvers at or near corner speed (minimum speed at which aircraft can achieve maximum g loading; it is usually around M 0,6 – 0,9). It must be noted that, while lift and excess thrust of aircraft can be approximated by wing loading and thrust to weight ratio, heavier aircraft will require higher thrust to weight and lift to weight ratios to achieve same turn rates as lighter aircraft. This is result of forces described above acting on aircraft. In this model, assumption is that aircraft can reach angle of attack required for maximum lift both with and without thrust vectoring, which is true for all close-coupled-canard aircraft, but not necessarily for tailed and long-arm canard arrangements. It can be seen that thrust vectoring increases angle of attack, and thus drag (as entire airframe at high AoA drags far more than just control surfaces plus airframe at far lower AoA), while reducing thrust avaliable to counter the drag – and, in case of very high AoA values, lift avaliable to pull aircraft around. While TVC can improve turn rate even at combat speeds, it happens only if aircraft is unable to achieve angle of attack that is required for maximum lift, one example being F-16, which requires 32 degrees AoA for maximum lift but is restricted to 25,5 degrees by FCS due to departure concerns. Angles of attack in excess of 35 degrees are unsustainable, however, due to massive drag they cause, resulting in very large energy loss, turning fighter into a deadweight in very short order. “Benefit” of extreme AoA values is also not unique to thrust vectoring aircraft: while TVC-equipped X-31 achieved maximum controllable angles of attack of 70 degrees (compare to 60 degrees for another TVC design, F-22), whereas close-coupled-canard delta-wing Rafale and Gripen are able to achieve controllable Angles of Attack that exceed 100 degrees, with Gripen being able to sustain Angle of Attack of 70 – 80 degrees. Further, X-31 without TVC was unable to achieve more than 30 degrees of alpha, even momentarily, whereas without TVC F-22 is limited to 26 degrees, though not due to issues of lift but rather controllability. As such, TVC actually improved instanteneous (and possibly sustained) turn rates of both aircraft by allowing them to reach angle of attack required for maximum lift, which is between 30 and 40 degrees of AoA. Aircraft that use TVC during combat to achieve angles of attack beyond lifting capability of wing actually sink in the air, as opposed to turning, but if they are unable to achieve maximum lift capability without TVC, then TVC does indeed improve their turn capability. Close-coupled canard configuration, on the other hand, drags less in turning than TVC one as it achieves same lift at lower angle of attack, resulting in far lower fuel consumption. This is important as in visual-range fight, most kills have been historically made when one of aircraft fighting ran out of fuel; thus aircraft with less fuel consumption per unit of weight is (assuming similar fuel fraction) more likely to win the fight. Specifically, maximum lift for close-coupled canard is greater than that for just wing at any AoA past 10 degrees AoA; in configuration analyzed in this thesis, lift is greater than baseline value by 3,4% at 10 degrees AoA, 34% at 22 degrees AoA, 9,4% at 34 degrees AoA, 7,2% at 40 degrees AoA and 18,3% at 48 degrees AoA. Thus aircraft does not need to achieve as high AoA for same lift to weight and lift to drag values, consequently allowing pilot a choice (assuming other values are similar) wether to achieve same turn rate as opponent and outlast it due to using up fuel far slower than it is case with fuel-hungry thrust vectoring maneuvers or try to outmaneuver it with higher turn rate. Neither is main “benefit” of thrust vectoring, post stall maneuverability, anything new. Aside from close-coupled canard designs, which have extensive post-stall maneuverability, Russian Su-27 has demonstrated stall recovery capability and post-stall maneuverability. It is also important to note that John Boyd was able to do Cobra in F-100, and other pilots did it in J-35 Draken. While TVC certainly improves post-stall capability, capability by itself is useless in multi-bogey scenario, as it bleeds energy very fast. As such, thrust vectoring is tactically useless for most fighter aircraft, especially in age of high-off bore missiles, as usage of thrust vectoring would leave then slow-moving aircraft very vulnerable. 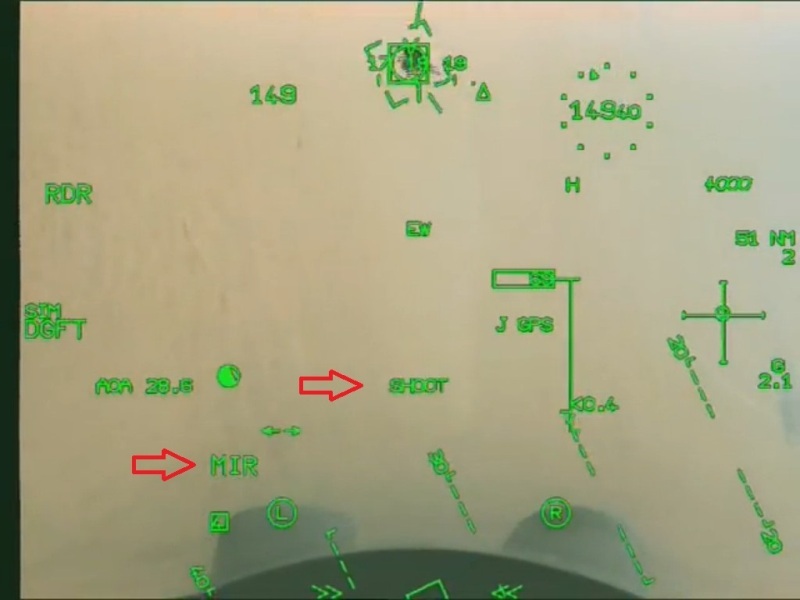 Further, Cobra – one of main “poster maneuvers” for TVC – is easy to see in advance, and if done, leaves fighter without energy and at opponent’s mercy; so while usage of TVC may surprise pilots that do not know what it allows, it is suicide agains pilots that are aware of it. TVC does not necessarily increase security either, as resistance to departure and superstall which it provides are inherent advantages of close-coupled canard designs. However, it does allow non-close coupled canard configurations to recover from these conditions. Using TVC for maneuvering is beneficial for tailed aircraft, however, at two regimes: at velocities well below corner speed, and during supersonic flight at high altitudes. Simple reason for that is that in these two regimes, flight surfaces are not very effective. 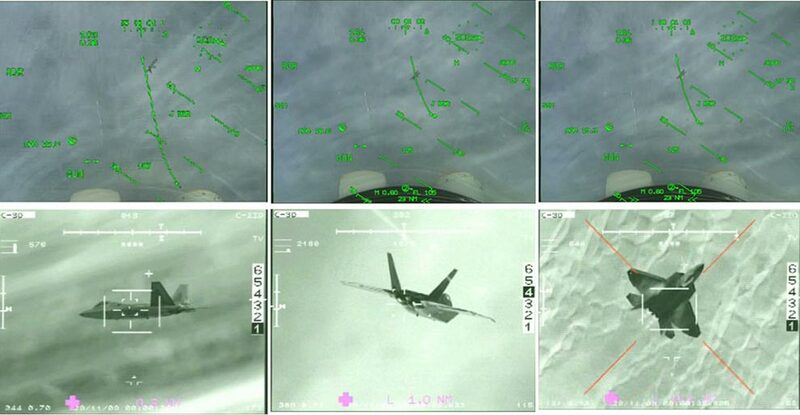 At very low speeds (150 knots – M 0,23 – and below), large control surfaces’ deflections are required for turning due to weak air flow, thus increasing drag – and even when surfaces are fully deflected, aircraft responds comparatively slowly. This also includes takeoff and landing; as result, aircraft with thrust vectoring can take off and land at lower speeds and in shorter distance than same aircraft without thrust vectoring; this capability can be useful if parts of air strip have been bombed (though it is always smarter not to require air strip at all). During supersonic flight, tail finds itself in wake behind the wing, which reduces its effectiveness. Thus thrust vectoring can be used to compensate for this effect. Further, at high altitudes (12 000 to 15 000 meters) aerodynamic control surfaces are less effective, and there is less drag, which means that thrust vectoring provides greater benefits and less penalties. As dogfights happen at altitudes of 1 500 to 10 000 meters, and speeds that start in transonic range, thrust vectoring is obviously not effective for WVR – and, therefore, real world combat. In level flight, thrust vectoring allows for trimming, thus increasing range due to reduced drag. 3D TVC nozzles can also reduce drag by optimising their shape. Further, thrust vectoring can add STOL capability to otherwise-CTOL aircraft, but it is always better to look at simpler, lighter and cheaper options. If aircraft lacks roll authority, TVC can be used for pitch, freeing up tail control surfaces to improve roll rate – examples of this are F-22 and Eurofighter Typhoon. F-22 does have major advantage in thrust-to-weight ratio over Rafale, however, allowing it to recover some of energy lost through TVC usage simply by flying straight and level for short time. But against aircraft with higher thrust-to-weight ratio, TVC usage will be even more problematic. Reason is simple: while TVC-aircraft relies on TVC to provide both lift and forward motion, close coupled canards allow for lift production beyond 100 degrees of alpha, while forward motion is provided by inertia. Energy loss is high, but so it is with thrust vectoring, and neither version of Cobra has any real tactical application.